Well the last couple of weeks have seen the Atlas settle into a rhythm where I can be pretty certain of achieving the daily 100 mile commute. 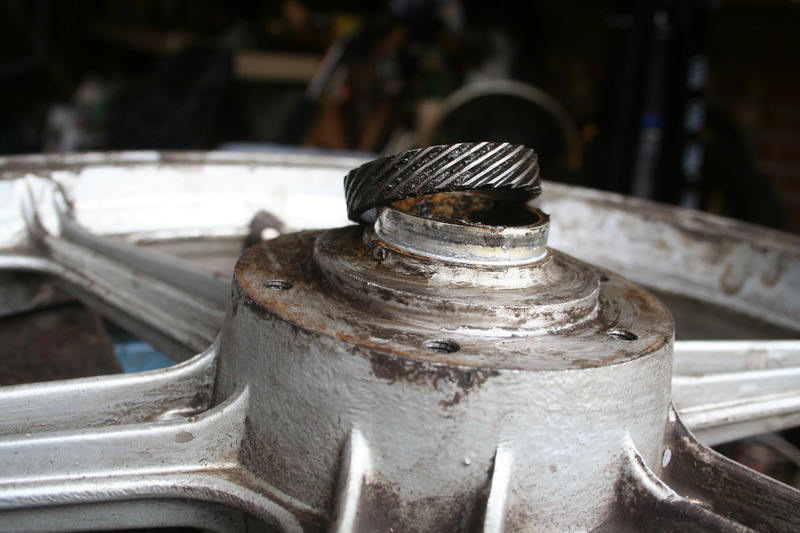 Using the SAE 30 hasn’t reduced oil consumption which is around 1 lite per 500 miles – maybe that’s too high but I am running Lada rings in honed bores so I’m sure the seal won’t be as good as it could be. I think there is an advantage at this time of the year however with the mono-grade oil in that starting doesn’t require the inadequate starting arrangement to spin through oil as thick as treacle! So aside from cleaning the Atlas at the weekend all is well – next task will be a new chain and sprocket set as these are both worn beyond what most would regard reasonable. The focus now has to turn to the triples and the RGA will be first up to hit the road. I managed to lever off the speedo gear for both the RGA and RGS and then set to cleaning up the wheels. I need to pop down the shops and get a fresh rawl bolt to drift out the wheel bearings but as these will be in the bin figure they can remain in during blasting. The RGA wheels are in a bad state with paint flaking off and the dreaded aluminum powder creeping along just beneath the surface. 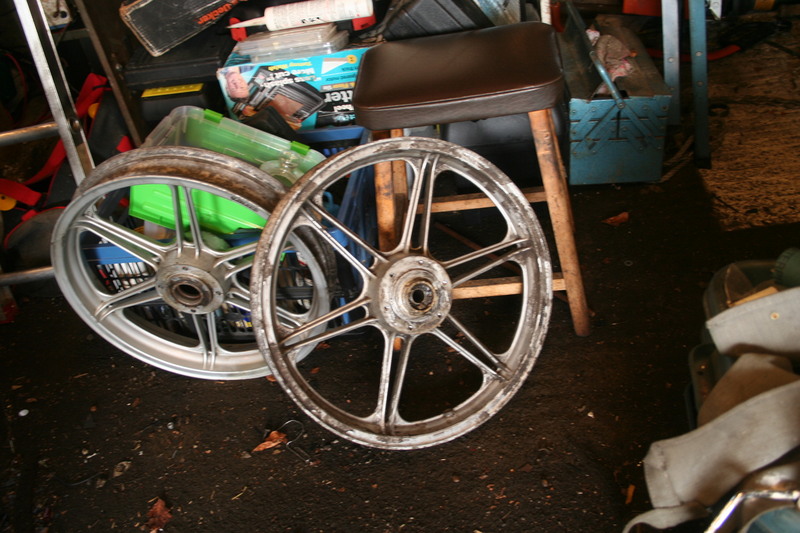 While I was preping the RGA and RGS wheels I also pulled out a thick web for the Jota as this needs painting. 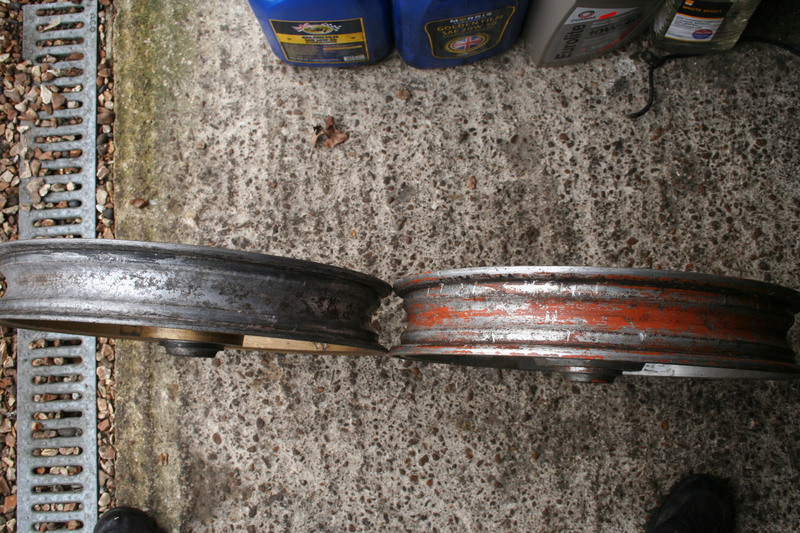 It was interesting to compare the thick web to the RGA back wheel – the RGA/S wheels are more delicate which may have been an attempt to save weight or most likely to save money. The wheels are the same width but you can see end-to-end the lighter construction of the later wheels. I’ve also been researching the best way to get my barrels returned to standard – SEP in Derby where recommended by Slater’s and they put in fresh liners and bore to size for £120 per pot. I’ve decided however to use a combination of www.westwoodcylinderliners.co.uk who will provide a cylinder at £87.50 each and then get them installed and bored at Paynes Engineering for £110 the set. The price is similar with the main advantages to me being I know Paynes and the work is done locally so any problems can be easily sorted. As a footnote I did read on the Laverdaforum that re-using pistons is a bad idea so fingers crossed my money saving idea doesn’t end up biting me in the arse! Well I think the ‘road-hardening’ process is complete! Just completed 3,000 miles and all the nuts and bolts appear to have settled down, the electrical gremlins been ironed out and it’s running good. Second oil change over the weekend and this time I’ve used straight 30 instead of 20/50. I’m not one to fuss over using special oils and had I had a tin of Morris’s 20/50 that would’ve gone in as normal but stocks were too low so straight 30 it is. I’m going to monitor the oil consumption because the Atlas does need regular top up’s and I wonder if having an oil that won’t go thinner than 30 might help out. The other benefit might be less strain on start up because the weight of the oil is thinner than 50. Let’s see. Attention now has to move towards a triple if I am to meet my objectives. I had to order some bearings for someone else’s project so loaded up the order with all the stuff for three triples. It will all be with me next week so I can press on with getting a motor built. 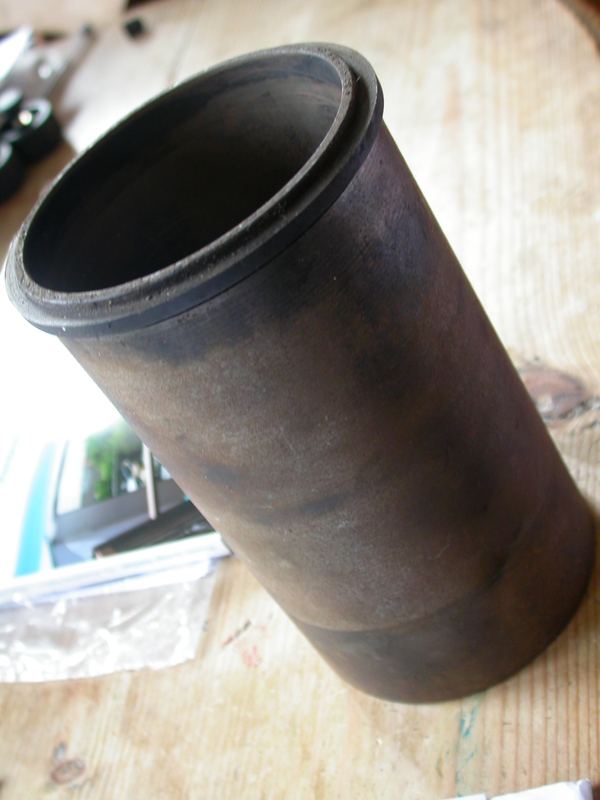 I’ve also put out feelers for some replacement cylinder liners. The one in the picture is from an ’81 Jota but I am looking for RGS replacements which are something like 15mm shorter. I’d put the shorter liners (shortened by Laverda for better lubrication) in all triples including the Jota. I’m going this route as standard used pistons are easy to source so new liners might work out more cost effective. If a dealer doesn’t have stock then http://www.laystall.co.uk/ should be able to help – but don’t know costs yet. I’ve also signed up for the ACU National Rally (http://www.nationalroadrally.co.uk/2015/index.php) – got my lowest number yet at #46, hey that’s Rossi’s number isn’t it! 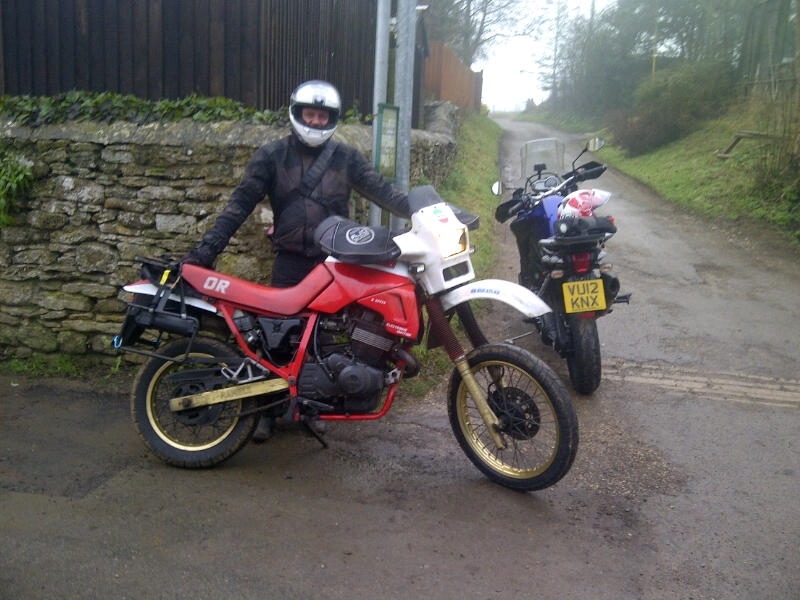 First weekend of the new year so decided to go for a wobble rather than fiddle in the garage – it is after all about riding motorcycles isn’t it? Fingers crossed the Atlas seemed to have come through the road hardening process and has settled into a good rhythm. It needs the oil checking across the 1500 service intervals but there isn’t smoke coming out the back so nothing I’m going to worry about. What really is starting to need attention however is the front brake which I’m sure now is warped. I am going to see if I can fit up a disc off a Yamaha FZR 1000. The ride over to Tadmarton started off okay but got progressively worse as I headed both north and onto minor roads. First off it got colder and this was accompanied by fog. The combination of these two resulted in icy roads – one village in particular (Wigginton) had a patch of sheet ice. I really dislike ice because whether you stay on is often just luck so I kept the bike plodding along in the most upright position and held my breathe. The ILOC meet happens on the first Sunday of each month – been going to these on and off for many years and it was good to spend a happy couple of hours talking nonsense with fellow Laverdisti. Well with all this Christmas stuff kicking off not much time for the Laverda – although I did decide to fit the muffs ready for tomorrow’s return to work. It’s just turned cold so head down and tough it out. The shortest day has passed but January is the worst month for commuting. I’ve also had to investigate a new sensor for the Koso digital speedo – it all checks out wiring wise so all I can think is that when I lost a wheel magnet it clouted the sensor. It’s going to cost around £15 so not too bad. Putting the speedo to one side and the warped and poor front disc to one side the Atlas seems to have settled into a good rhythm. A trip down to Southampton had it purring down the A34/M3. Looking back across the year it’s been pitiful in terms of getting the stable back on the road, especially as I made good progress at the start of the year having the triple engines split and a replacement engine shoe’d into the Atlas all by the end of March. Totting up it seems I’ve spent 7 months of the year on the Atlas (clocked up about 14,000 miles in this time), 3 months on the VFR and 2 months with no motorcycle at all! For someone with 10 motorcycles this ain’t good! At year end I have just the Atlas on the road with the next closest being the 100 which just needs the exhaust system putting back on. Incredibly the 100 has been in this state for 18 months or so – I haven’t ridden it on the road since it completed the 2013 National Rally. The Atlas began its ‘season’ with a second-hand motor that was part of an Atlas ‘job-lot’. 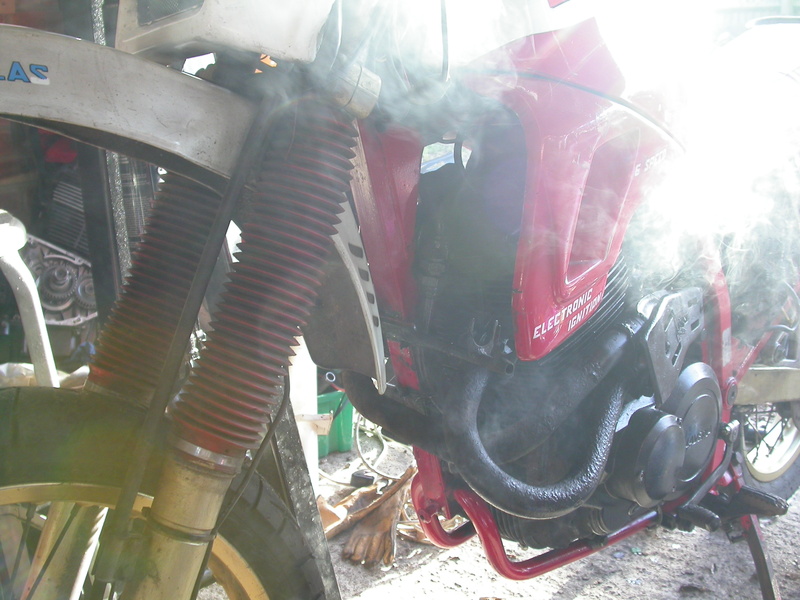 The donor bike had been written off in Romania but the engine just seemed to suffer a cracked primary case. When started it sounded and ran sweet but as the miles piled on it succumbed to the normal Atlas trait of messing the starter sprag and then developed a top end rattle which I just ignored… When that motor expired it was back to the original engine which turned out to have a loose inlet valve seat, tired valves and rings. Getting the Atlas to work though has been a major step for me in that aside from the 100 it is the first engine I’ve built from the bottom up since an A65 30 years ago! I kept saying to Mrs A that it had to be simple – just four shafts in a bed, and so it proved. I can see now that the complexity of a Laverda motor rests mainly in the head. Steve Winterton spends a long time making sure the cams spin properly and given the rest of it is just big lumps with bearings it makes sense that poor cams and valve timing are the key to a sweet motor. The second Atlas from Belgium needs cosmetic work and registering in the UK – the latter being the main obstacle but something I seem to have resolved via a recent email exchange and so I could soon have an Atlas ‘contingency’. The Atlas is a good bike but not as good as a triple. The way these bikes cruise at 90 MPH is something I’ve missed and I find myself day-dreaming about 120’s. There is hope however in that I have two reconditioned cranks waiting and a good engine shop close by to overhaul the valve gear. Riding-wise 2014 has been a bit ‘light’ with just one trip to the Continent. The ride from Calais to Cannes was quite epic and relatively trouble free with just a starter solenoid playing up.I enjoyed the idea of an epic journey (sea to sea) and ride over to Grenoble and then up to Briancon was spectacular. Similarly the route over from Barelonnette to Castelanne a bit squeaky bum! Down into and then onto the beach at Cannes was strange – swimming in the Med’ and rubbing shoulders with the ‘in’ set – but stranger still was a few hours later being confronted by hail stones up in the hills!!! The overwhelming memory however was just what a push it was to cover so many miles in such a short time. Was this fun or too much? Well the experience meant we bailed out of going to Breganze for the 65th year celebration – too far and too bloody hot. Has age crept up on me? By June however we’d completed the Welsh National which resulted in 400 mile day and quite a few ‘moments’ as the sun disappeared and the realisation that the Atlas lights were wholly inadequate. The weekend however was a good adventure. I particularly enjoyed the ride up to Shrewsbury via Leominster as this is a route I’d only done in the pitch black on the 100 during the National. Hopefully in 2015 we’ll have a bit less rain so we can take in the views – some of which we got to see in September when we visited Swansea en route to the ILOC rally in Hay-on-Wye. The ILOC rally also provided the only real opportunity for me to test out my LED lights and Andy Strapz panniers – when the LED’s got turned on Mrs A just burst out laughing when the world lit up! More drama with the National where with less than 20 miles up I had to have an oil cooler plumbed out. The ride up to Thirsk had been worthwhile and the final ride down the A34 to the end bliss as I knew I just had to bring it home for a well earned Gold. I’ve really got into these distance challenges which let me see new parts of the UK. End of March – have RGA on the road! I want to get over to Europe a few more times in 2015 but not necessarily to ‘Laverda’ events. I remember back on 1987 with the Jota we’d do things like the Grand Prix’s or the 24 Heures Le Mans. I like to head out with some purpose but it would be good to mix this up and just turn up as a motorcyclist who happens to be on a Laverda. The National Rallies have also shown me that there are many parts of the UK still to be unlocked, especially the midlands and east coast.